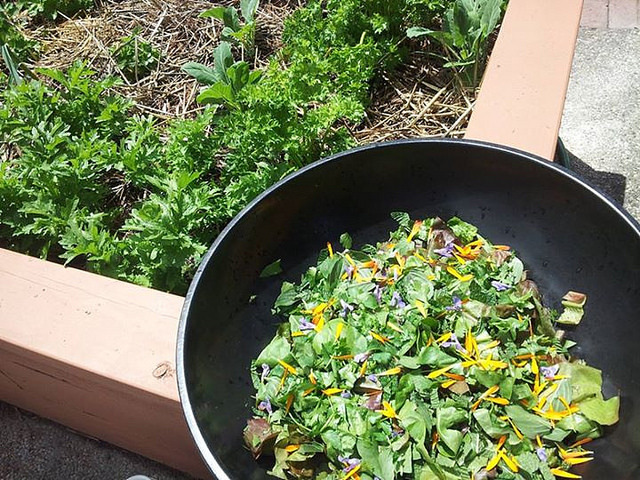 Salad from the garden at City of Refuge United Church of Christ for our salad dressing competition. Poetry is an important form of education and activism, and Gloria Anzaldua honors this tradition through her poem that draws attention to the experience of a farmworker struggling in the agricultural fields within the standard working conditions of the modern industrial food system. In this lesson, participants take part in a salad dressing competition using simple nutritious recipes and together they read Anzaldua's poem in both English and Spanish. Participants are also introduced to the organizing work of the United Farm Workers and the Coalition of Immokalee Workers.